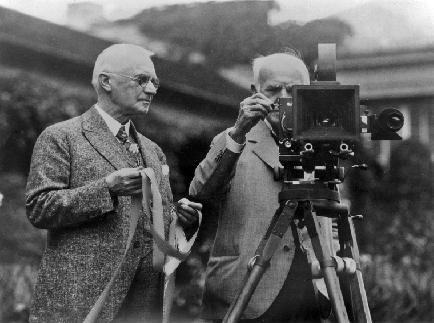 Kodak founder George Eastman alongside Thomas Edison. This article is part of a feature of four articles detailing 120 years of cinematic history. Colour in film, as we know it today, did not appear until the late 1930s. However, there was a colourful history (pardon the pun) of its use before that time. The use of colour was started almost as early as film itself. In 1895 Thomas Edison's group, as well as others in the near future, used hand painting as a technique. This required the painstaking hand colour of every single recorded frame. Although possible as a novelty in the early days of film, this method of colouring frames became unrealistic as the length of films began to increase. After the turn of the century a new technique was introduced by Pathé Frères in which a machine with numerous dye soaked rollers and stencils would perform the task of painting frames previously delegated to artisans. Glass stencils of the entire film were etched along with the corresponding areas to be colour. Then the stencils were placed over the print, and the two were run through the machine with the dyed rollers. This technique, while slightly better than hand colouring, was still very time consuming. Around the same time, two other colouring methods existed that were commonly used, however, they did not provide the same level of colour quality. The first, film tinting, involved soaking the film in a tinted base which had the effect of producing a monochromatic colour. The second technique, film toning, had a similar effect, but with the film being pre-tinted as opposed to tinting the film after recording. On top of these techniques existed even more, equally creative methods of adding colours to early films. One such method was Additive Colouring which involved the use of filters on both the camera and the projector. This normally required shooting two films simultaneously, one with a green filter and one with a red filter and had some rather serious deficiencies. The problems included "haloing" or "ghosting" of the imaged caused by a mismatch of the two colour films. As well, a greater amount of light was required than could often be supplied which caused the edges of the projected images to appear dimmer and more difficult to see. However, even with all the problems, the technique of Additive Colouring existed from the turn of the century until the 1930s when it was replaced with the more efficient Subtractive Colouring System. The Subtractive Colouring System was created by William Van Doren Kelley in 1917, but improved upon by engineers for Technicolor in the early 1920s. Their process used a beam splitter which transmitted red and green light waves to separate films in a specially modified camera. These two negatives were made into two prints, one with a red tone and one with a green, and then melded together into one finished filmstrip. Technicolor's system was popular for almost a decade, yet it was another very expensive and time consuming process, and as a result Hollywood did not completely embrace the use of colour. On the verge of extinction until the early 1930s, the use of colour was saved by a new invention by Technicolor in 1932. This new system used not just red and green waves but also blue, which, when used alongside a special camera, three, not two, negatives were exposed, one for each of the three primary colours. After the negatives were put through a special developing process, the finished film print was able to project a much fuller range of colours onto the screen. This new method of adding colour to film dominated for a few years, however, a 1947 anti-trust lawsuit and the introduction of a new film type by Kodak in 1952 led to the collapse of Technicolor. From the mid 1930s on Kodak-Eastman developed and then improved upon a type of film called monopack. In this single filmstrip is embedded three separate light sensitive layers, one for each of the three primary colours, upon which white light is "subtracted" to its corresponding colour layer. While early versions of this type of film were successful, it was not until the 1952 introduction of Eastmancolor that they created a truly economical and viable substitute for the Technicolor and the other multi-negative based colour film systems. Due to the reduction in film and development costs for the monopack style of film, Technicolour's system because virtually obsolete. However, Technicolor's process has never completely dropped from use, in fact, some films still use it to this day because of its ease of storage in comparison to the more fickle monopack. Eastman-Kodak's monopack film, while continually undergoing improvements, is still primarily the only type of film used today. It is now made up of even more layers though, allowing it to produce a wider range of colours and a more stable storage vehicle for the colour with a decreased likelihood of colour loss. The use of colour may have been a major innovation for the film industry, but the single most important advance in film happened in 1926 with the first use of synchronized sound and the birth of the "Talkies". Look for this in the next and final instalment of, The History of Film.